Leaving early in the week for hiking, peak climbing, with Snow Valley Peak and Wells Peak, and culinary treats in and about Reno, NV, I hoped that this easy lead would go well. Another SPS climb was being led in the same area this same weekend. While my plans were more ambitious, I would have preferred to have joined the other trip, since it was a Master Emblem completion. But, the pre-trip planning suggested that people should have a choice (?). I motored south on U.S. 395, recording the usual photo stops. Saturday morning, one participant's car had given out in Lee Vining, CA, so I gave him a ride up to the trailhead at Tioga Pass. There were six of us again. I asked to organize a shuttle, since that would save us two miles of walking. I bought a park pass ($20), but urged the others to save their money. We then decided that setting up a shuttle would take too much time. We headed up the Mt. Dana use trail by 7:30 a.m. The group was fast. I struggled to maintain my advanced position, but had to use tricks like halting for a break, then taking off when the others were stopped. Finally, when we approached the summit, I let some of the others go for the top. I took slightly over three hours. The views, especially of Mono Lake over the Dana Plateau, always remind me of a view from outer space. Mono Lake lies 6,700 feet below. We gained a nice view of the Mt. Lyell group of peaks to the south. Mt. Lyell (13,114') is the highest point in Yosemite National Park. The big Lyell Glacier is seen directly below the peak. Mt. 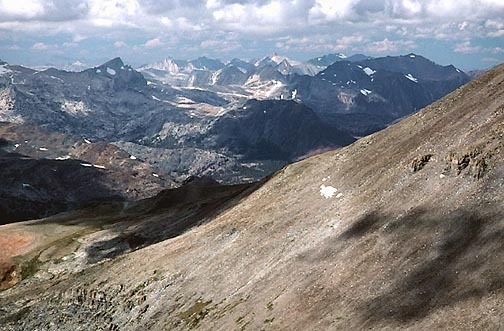 Maclure (12,988') sits to the right of Mt. Lyell. We then descended the southeast slopes of Mt. Dana. On our traverse to Gibbs, we passed the other SPS group. They were already headed down. I had to detour along the ridge to avoid a steeper section, which was said to be class 3. Since this was an I-rated trip, by Angeles Chapter rules, I wasn't allowed to lead that. It looked fun. Topping out on Gibbs at 2 p.m., we enjoyed more cloudy views with softer light. It was all downhill now. Time to go back down, I chose the easy West Ridge, class 1, to hike down back to the Mono Pass Trail. My assistant's knees were hurting, so I had to slow and wait. We had plenty of time, and regrouped often. We finally then came to the trail. It was still a long, fairly level, walk to the highway and then to the Pass. To avoid even the foot travel entrance charges, my assistant picked up the others and drove them, on his pass, through the entrance station. I had just walked through, flashing my own pass. We all were back to our cars by about 5:30 p.m.
Three of the group decided to bail, since the scheduled climb of Koip Peak (12,979') would be a long, hard day. The two peaks today, on an official SPS trip, fulfilled the section membership requirement. That was enough for them. The rest of us motored down to Lee Vining Canyon to join the other SPS group. I had a restaurant meal in town, and drove back to the County campground where the party was in progress. I woke up early for the next day's climb. After a good restaurant breakfast, I met the remainder of the group at the Mono Pass Trailhead. The assist's feet were blistered. Despite his brave acting, I suggested doing Tioga Peak, which would be much easier. Koip Peak would be over 18 miles round trip, with some 3,500' gain. These two others, the remainder on this trip, agreed. We drove to the trailhead along the Saddleback Lakes Road. A trail leads to Gardisky Lake. Just before the lake, a use trail heads off right to ascend the peak. The view was fine and the winds were very high, about 60 mph. It was a good thing to have done this summit, instead. My summit register book, from years ago, was signed in by all of us. We were down in about an hour, and we shook hands and departed. It is about an eight hour drive back to the L.A. Basin from here. My stats for the SPS weekend trip, only, were some 12 miles and 6,100' gain. I had done another peak, with more hiking, in the days before my scheduled lead.